I do not want to keep the calendar running in the background! Is understandable, but the solution is also very easy to run the calendar only if this is needed! If you want the calendar to disappear when you close it does not disappear in the info area (to-tray) of the windows taskbar. Then you have to disable the option: To-Tray when closing Alt + F4 . So, now if the calendar is closed, for example by Alt + F4, it will actually be terminated. If you have placed the small program file on the desktop, you can quickly and easily use the calendar again. As I said, it is understandable that some cautious users do not like too many programs running in the background. If possible, always use ... the latest version of Desktop.Calendar.Tray.OK! (Image-1) No keep the calendar running in the background! 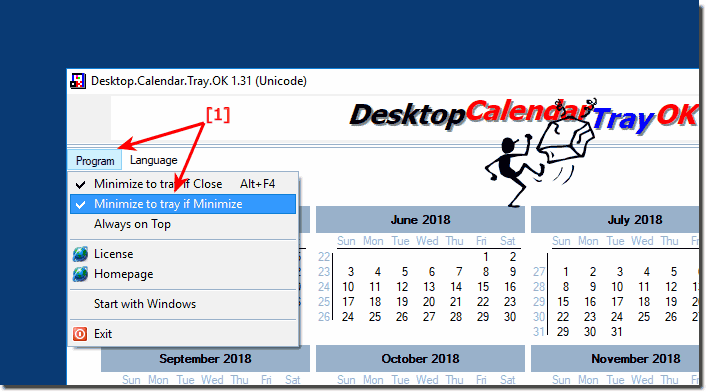 Desktop.Calendar.Tray.OK - FAQ-1: I do not want to keep the calendar running in the background! Why the days in the left area to the date difference output? Uninstall Desktop Calendar from the Windows Desktop! Why is not an organizer integrated (to allow event scheduling and notifications)?